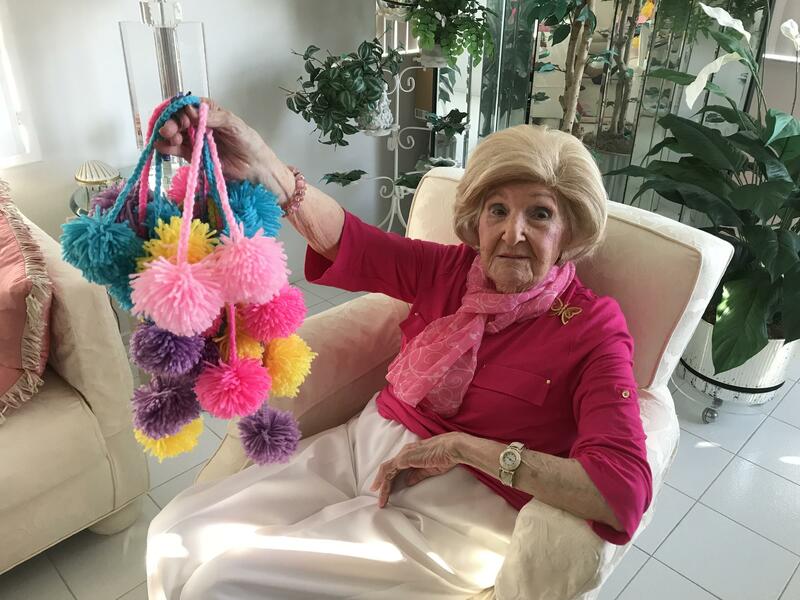 Mazie Ford knits colorful pom poms to sell, in order to afford more yarn so she can continue to make hats for the newborns at Memorial Regional Hospital in nearby Hollywood. Marla Oxenhandler (left), Johann Levinson (right), and Mazie Ford (center) all gather together for talking and knitting in late November, 2017. 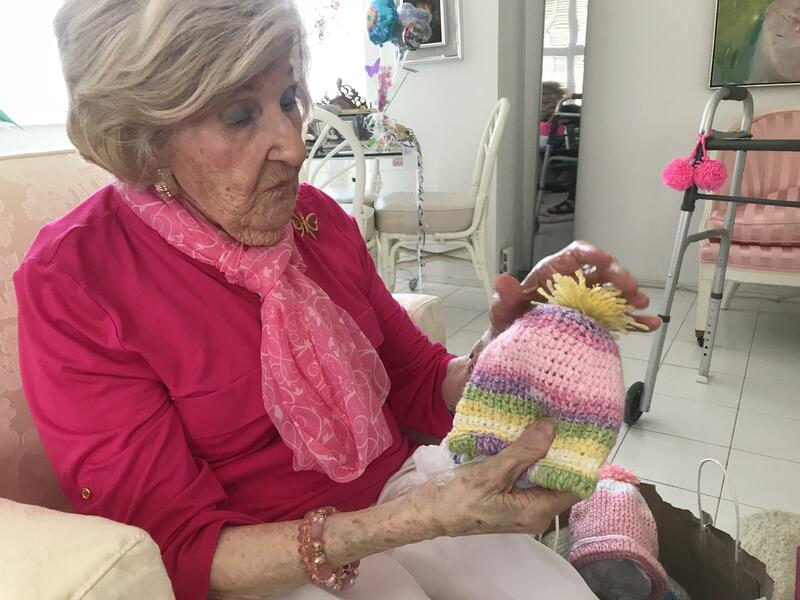 Mazie Ford's knitted hats for newborns are "like snowflakes," her daughert said. No two ever look alike. Here, Mazie shows me a new pattern she is proud of. She was born on June 28, 1906. That makes her the oldest verified living person in Broward County, and the second oldest in all of Florida. 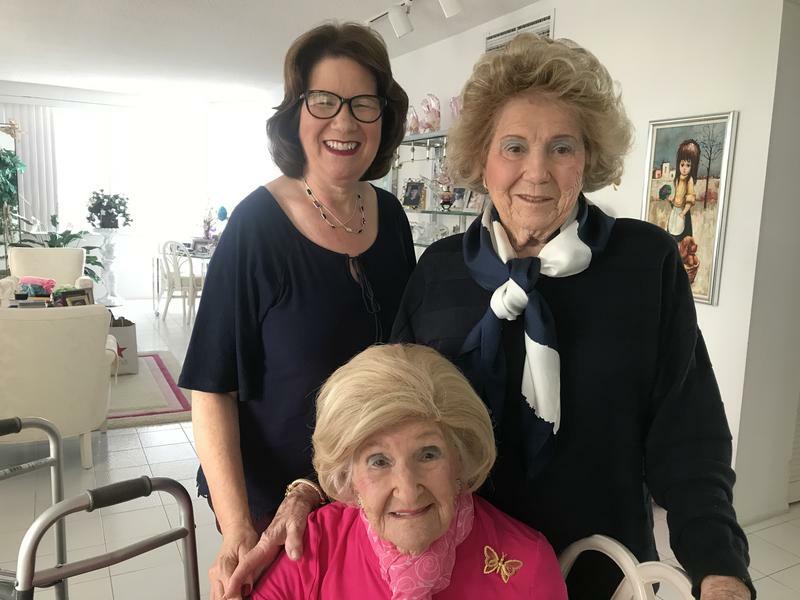 Mazie still lives in her Hallandale Beach condo after first becoming a snowbird there in the late 1960s. She always wears a blonde wig, some blue eyeshadow and a pink blouse with a butterfly broach. She likes to tell people, they will never catch her without her pink lipstick on. She still has the energy to sit and have nearly three-hour conversations, especially if they involve some of her favorite topics, like the TV show "Dancing with the Stars." "Does he look familiar? Here he is!” Mazie exclaims. She jumps up and grabs her walker to move quickly across her condo to show off her prized picture of dancing star Derek Hough, with his arm around her, on her 109th birthday. She doesn’t spend a lot of time focusing on the past. Like many South Floridians, Mazie would leave her northern home in Philadelphia to spend winters at the beach. She used to come with her first husband, Harry. Her daughter, Johann Levinson, called her mother in Philly one day in 1967. She asked her mom to spend the winter at a then-new development called The Hemispheres. Johann remembers Mazie passed the phone to her dad. 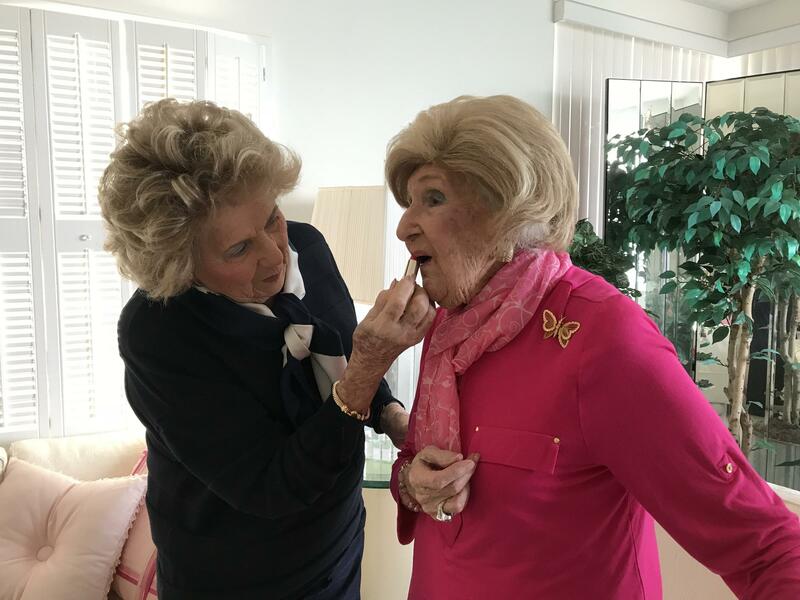 Johann Levinson (left), helps her mom, Mazie, (right), put on her signature pink lipstick. “She said he wouldn’t say no to me and that’s how they got their first apartment in this building,” Johann said. Mazie still lives in the same condo, independently, though a nurse helps her now. Independence has always been important to her. She got married in the early 1920s - shortly after women got the right to vote. She was 16 years old. “Oh, when my husband asked me to marry him, I said, ‘only if you buy me a car,' ” Mazie said. 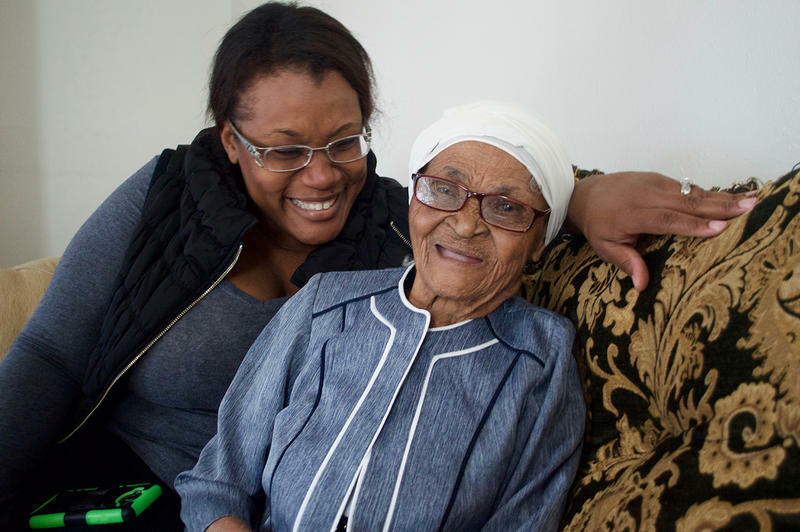 By the time Mazie moved to Hallandale permanently, she was a widow who had just remarried. “I played a lot of golf, I played a lot of bridge and I had my own car,” Mazie said, fondly. Though she can’t play golf anymore, she still loves her bridge and mahjong. Daughter Johann comes over almost every day. The good genes run in the family, Johann turned 90 at the end of November 2017. “She was always a sharp lady, an excellent bridge player, a terrific mahjong player,” Johann said about her mom. Mazie’s best friend now is Marla Oxenhandler. She often comes to visit too. There are 51 years between Mazie and Marla. “It’s just like talking to someone my own age,” Marla said. And Mazie agrees there’s plenty to keep up with. “Oh we talk about families - and I’m interested in her family,” she said. Marla’s grown kids live in Philadelphia, and Mazie loves hearing stories about the place where she grew up and what it’s like now. Mazie has always been artistic. And, she’s kept that up. For her 100th birthday, as a party favor for her guests, she made small wire butterflies with hundreds of tiny pink beads. By hand. 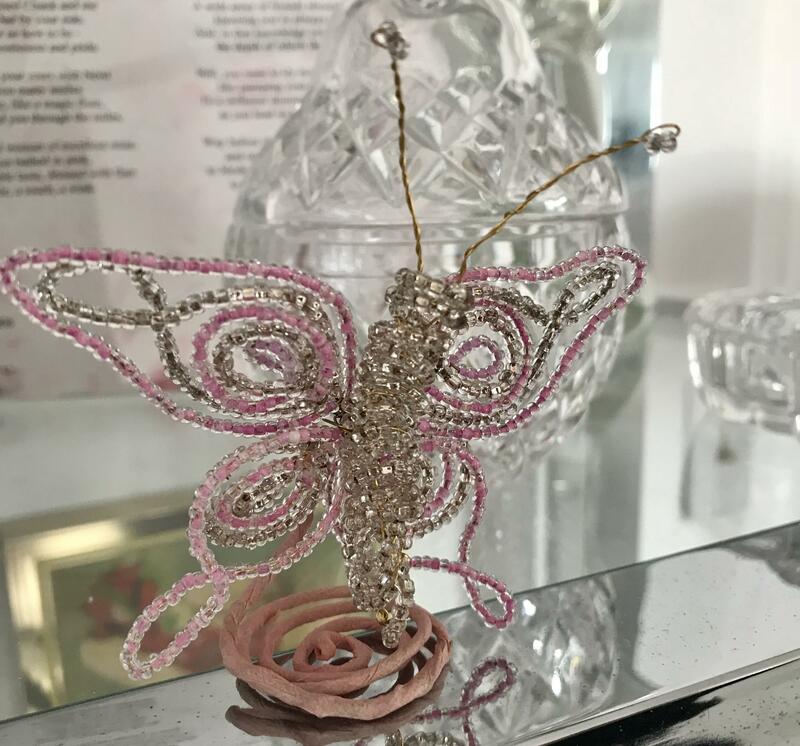 Mazie hand-made pink-beaded butterflies like this one for her guests at her 100th birthday party. The whole butterfly is about two inches tall. When she got bored with beading, she moved on to knitting. She started with blanket squares for the non-profit, Warm Up America. Now, she’s been knitting and delivering hats for newborn babies at Memorial Regional Hospital in Hollywood, every month. It’s the only time she leaves her condo these days. The hats are how she and Marla met. Marla used to work for Memorial Regional. “She used to just bring them and drop them off at security and it didn’t make her feel that good because she didn’t see where they were going,” Marla remembered. So, Marla started taking Mazie to visit the families who received her hats. Mazie showed off a pink, yellow and green hat, with a big yellow pom pom on top. She fills them with tissue paper so the hats keep their form. Mazie stuff the hats she knits for newborns with tissue paper, so they look pretty when she delivers them to Hollywood families at Memorial Regional Hospital. Daughter Johann helps knit the hats, but not as many as her mom though. 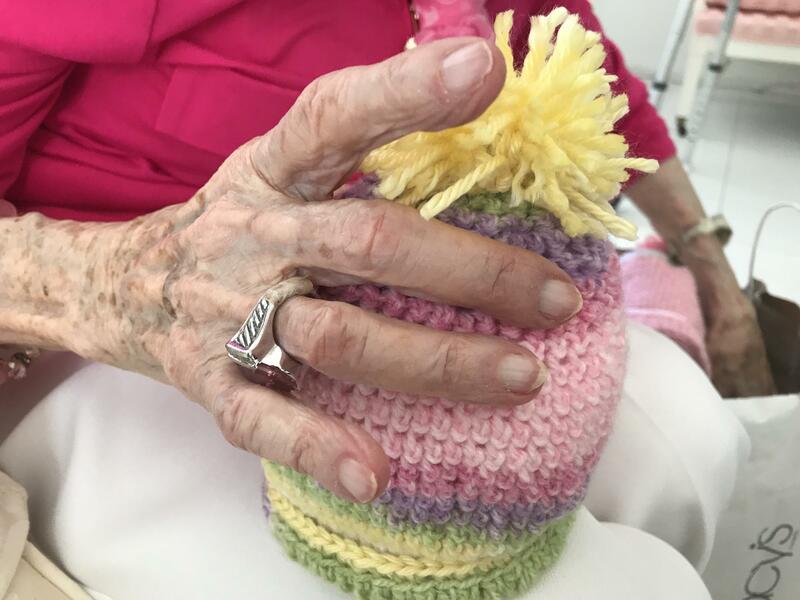 Mazie and her 90-year-old daughter used to knit at least 50 hats a month..but they’ve slowed down a little. Now it’s anywhere from 25 to 35. “‘Cause I can’t work as fast, and she can’t work as fast,” Mazie said about her and her daughter. “Can you imagine she doesn’t work as fast at a 111 and a half?” Marla chuckles. Mazie Ford is already looking forward to her 112th birthday. For the past few years in a row, she’s had dinner at a restaurant on the bottom floor of The Hemispheres condos. She hopes Marla and her husband can be there with her and Johann again in 2018, to eat steak together. Is This Broward Woman The Oldest Person In America? Definitely Maybe. Regina McNish knows her grandma – Lauderhill resident Dorrisile Dervis – by another name. And Gran Dor is grand indeed. 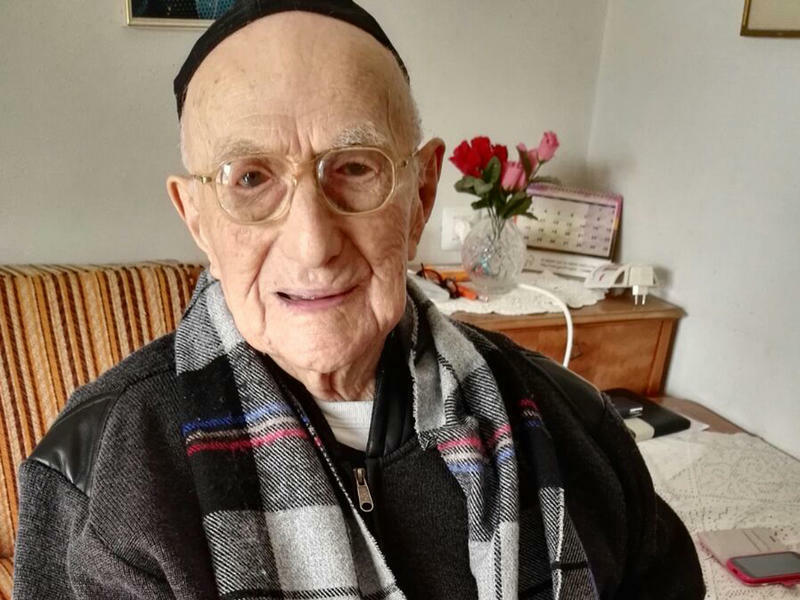 Born on Christmas Day in 1901, Gran Dor is 115 years old. That makes her the oldest living person in the United States. The problem is … her family never had Gran Dor’s birth certificate. She was born poor in rural northwest Haiti at the turn of the 20th century. McNish says Gran Dor was probably never registered. As a young boy, Polish-born Yisrael Kristal looked forward to turning 13 when he could celebrate his bar mitzvah, the Jewish coming-of-age ritual. But that was 1916 and World War I crushed that hope. Little did he know that he would wait a century for that ceremony.